There are several heart rate related parameters that should be monitored in order to have some information regarding the state of the athlete. 1) Resting heart rate or the morning heart rate. The monitoring of morning heart rate has been suggested as a tool for analyzing the adaptation of the athlete to training load with the increased heart rates have been suggested as a sign to decrease training load or an additional recovery. Morning heart rate lowers if the athlete gets more fit in endurance. If an average person will have resting heart rate values of 70-80 beats per minute, endurance training can lower it to 50-60 beats, even lower than 40 beats, as been seen elite endurance athletes. The monitoring of morning heart rate is simple, after wake up, simply lie in the bed and count your heart rate (or use the heart rate monitor instead). Use 15 or 20 second count and multiply it with 4 or 3 and write down the result in the training diary. If you use heart rate monitor, fix the lowest value during the one minute recording period. If there is an increase in your heart rate for more than 5 beats, consider using lowerl training load on the following day. An increase of more than 10 beats should indicate a recovery day. However you must must take in mind that morning heart rate is quite a sensitive pareameter to any type of stress (bad sleep, infection, low glycongen stores, mental stress etc.) and all those possible factors must be considered before interpreting the resutl and the final conclusion of the nest training load. Different studies in elite athletes have indicated that resting heart rate may not be good parameter to avoid excessive training stress. However, there is great individual variability and the mehod could be suitable in individual level. Another alternative in addition to resting heart rate is to include standing heart rate measures, that gives better and more reliable results on the condition of the athlete compared to resting heart rate alone. The test initiates a heart rate response to the standing motion (and gravity) that the body has to quickly adapt to. Figure 1. Orthostatic heart rate test values on three different conditioins. 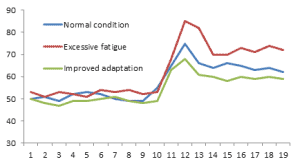 In the above sample diagram, the suggestion is that a clearly elevated heart rate during standing positioin (i.e., 8-10 beats + above normal) is a possible sign of some excessive fatigue or inability to recover normally. This may be due to both, hard training and poor recovery time, the onset of some illness, or other forms of life stress. On the other side, if you see the heart rate dropping slightly, it may be an indication of improved adaptation and fitness You can also interpret the shape of the heart rate spike caused by standing. A steep climb and quick drop in heart rate indicates a heart that is more rested and sharp than a spike that climbs slowly and descends slowly. The values of the test are very individual and it is wise to compare only the of one athlete with him/herself, not with the others. 3) Heart rate variability. Heart rate variability (HRV) anlysis has been used to measure cardiac autonomic balance, with an increase in HRV indicating an increase in parasympathetic (vagal) tone, relative to sympathetic activity. HRV is highly influenced by aerobic fitness and large at rest, meaning it fluctuates largely. For example, if heart rate is 60 beats per minute it does not mean that the time interval between each heart beat is 1 second. It can vary a lot and the more it varies the higher heart rate variability the athlete has. Higher heart rate variability has considered as the condition where the human body is very adaptive to sifferent stress factors. This means that the training is effective if your heart rate variability is high. If the stressors accumulate your heart rate variability decreases and the body´s responsivness decreases and traings become less effective. Other factors that affect HRV are age, body position, time of day, and health status. During exercise, HRV decreases as heart rate and exercise intensity increase. HRV also decreases during periods of mental stress.